Camping Cookware Mess Kit Portable Lightweight Backpacking Hiking Gear cooking equipment 13 piece cookset. FREE additional Spork, Carabiner & Mini Stove. For Scouts, Hunting, Bug Out Bag and Outdoors. 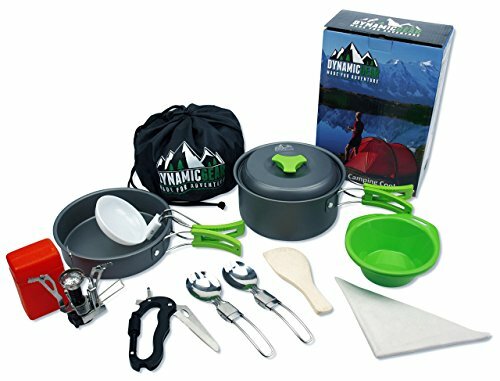 At DynamicGear we deliver the best bundle with the highest quality compact camping cookware mess kit created with the outdoors in mind. This gear features 13 pieces which fits into a nylon bag. No more carrying heavy equipment on your next camping trip or backpacking/hiking adventure. With the mini stove you no longer have to wait for the fire to be built. Delicious food is only minutes away! We have also included a free second spork! This truly is a 2 person cookware set. All the cooking utensils you need. Oh we almost forgot, we included a Multi-tool Carabiner! At Dynamic Gear we also care that your camping cookware kit comes to you without problems so we have a special made box for it and extra protection for the mini stove. When you see our box you can drift away as if your sitting outside your tent on the ultimate adventure. This outdoor bundle is great for camping, hiking, scouting, survival, bug out bag, emergency situations, picnic and adventure! This cookware is Made For Adventure! Our stock is limited, so don't hesitate, order this camping cookware today! BUY NOW WHILE SUPPLIES LAST. Click "ADD TO CART" button to get your cookware now. Unlike other cookware sets we have specialized packaging to make it the PERFECT gift, So buy one for yourself and one for your friend! HIGH QUALITY BUILT TO LAST - We use the highest quality material approved by the FDA. No Chemicals or harmful material! The bowls are BPA Free. The cookware and accessories all collapse into a small bundle for easy storage. The mini stove comes with an orange case and fits in your pocket! DYNAMIC BUNDLE - With this amazing camping cookware mess kit you get 1 Anodized Aluminum Nonstick Pot with side wall measurements (1 Liter Capacity) + Pot Cover + Nonstick Pan + 2 BPA Free Green Bowls + 2 Folding Stainless Steel Sporks + BPA Free Soup Spoon + Wooden Spoon Spatula + Cleaning Multi-Purpose Microfiber Cloth + Nylon Travel Bag Drawstring Pouch + Piezo Ignition Camping Stove with an Orange Case + we also include a 5-in-1 Multi-tool Carabiner! MULTI-USE KIT - This cookware is lightweight and easy to store. The cookware when packed up is just over a pound which makes it ideal for any outdoor situation including a bugout bag. This kit is great for 1-2 people. Great for any survival situation. DynamicGear has made your camp kitchen set very mobile so you don't have to carry any bulky pots/pans anymore! PERFECT GIFT - Being an amazing 13 piece bundle this is great gift for your family or friends. Also for any campers, hikers, boy scouts, girl scouts, bikers, survivalist and really any outdoor enthusiasts! Do you know a prepper? Make sure they have this cookware for each of their bug out bags! 100% SATISFACTION GUARANTEE - We care that you receive your product in one piece! DynamicGear is dedicated to address any product/service issues to ensure your outdoor experience is Dynamic! If you have any questions about this product by DynamicGear, contact us by completing and submitting the form below. If you are looking for a specif part number, please include it with your message.